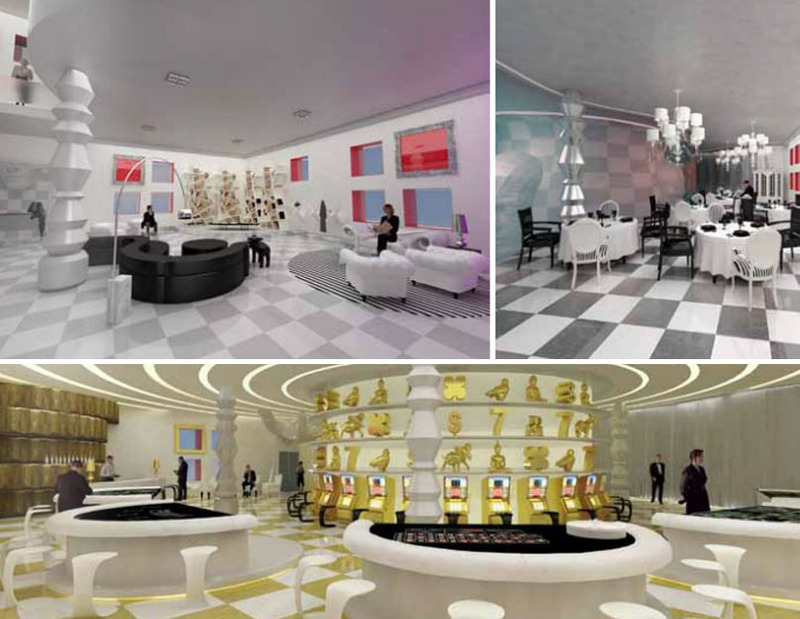 Awhile back I came across a student project for a redesign of the Casino VLC in Valencia Spain, by interior design student Vicente Ortuño at Escuela de diseño Barreira. 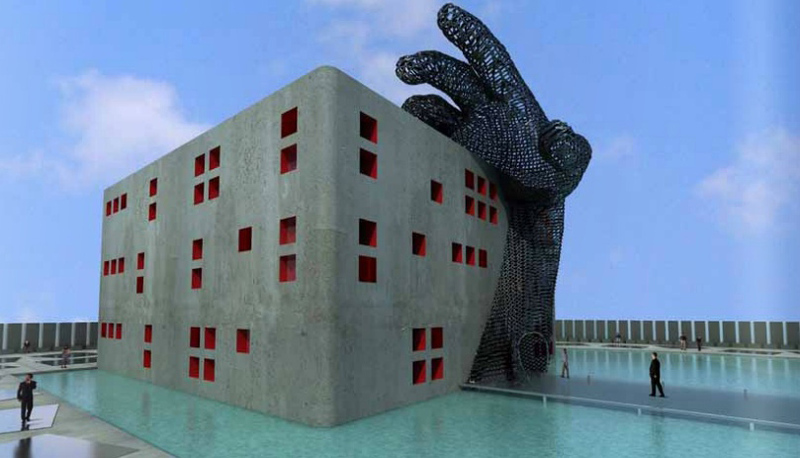 The design features a large sculpture of a hand wrapping around the building as if grabbing it. 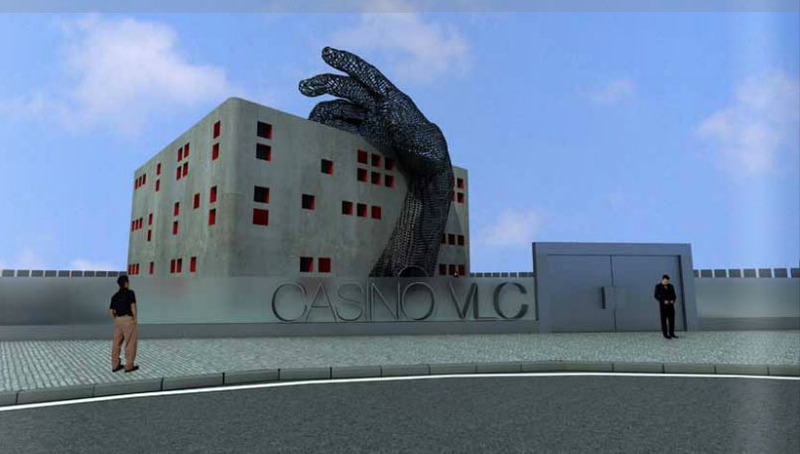 Ortuño’s design is meant to break with the traditional Roman architecture approach to casino design. He opted for a surrealist vision, with a dreamlike quality in a place where people hope for dreams of winning and wealth to come true. The hand was specifically chosen for its presence in such game-playing phrases as “a good hand” or “sleight of hand” as well as for its strength, not to mention making a clear indicator as the main entrance. Shortly after, I came across a case study for a house in Los Angeles by Greek architect Andreas Angelidakis who maintains an experimental practice in Athens which involves “building, designing and speculating the contemporary ecosystem of screens and landscapes. He usually operates at the intersection of systems: Art and Architecture, Virtual and Real, Building and Nature, Ruin and Construction.” Angelidakis’ design for the Hollywood Hand House has an involved story behind it. Basically, a concrete hand of a giant girl punches through a mountain off Wetona Drive from the direction of the Hollywood sign. After the anger subsides the hand comes out of a reservoir water basin and elegantly holds a glass box building on a serving tray, perched over the cliff like a billboard. 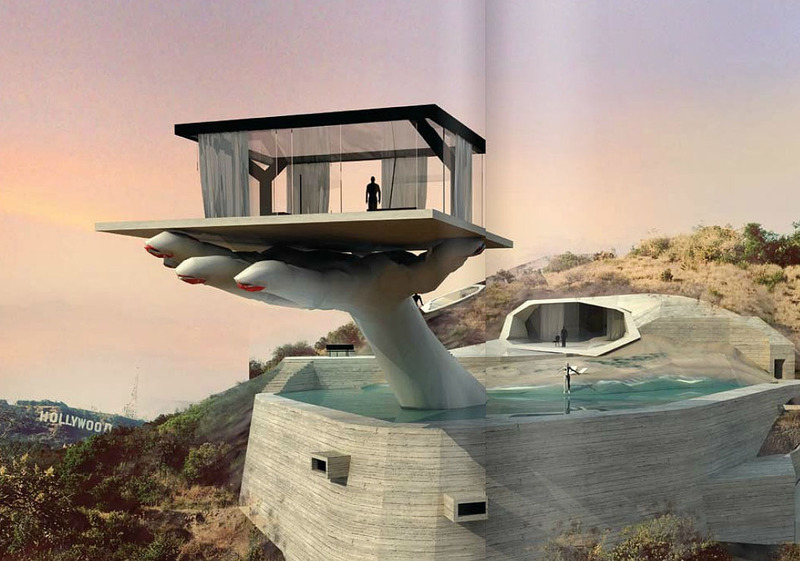 The punched-out cave and glass house are connected via the reservoir which is converted to a swimming pool…it’s quite a fictionalized and surreal story which you can continue to read about on Angelidakis’ blog. Obviously, they seemed like natural projects to group together…you know, with the giant hands and all. Both projects have a creepy quality, but then, I think that’s what each designer was going for. Images courtesy of the architects. This entry was posted in Architecture, Art, Fun, Just Plain Cool, Pop Culture. Bookmark the permalink.